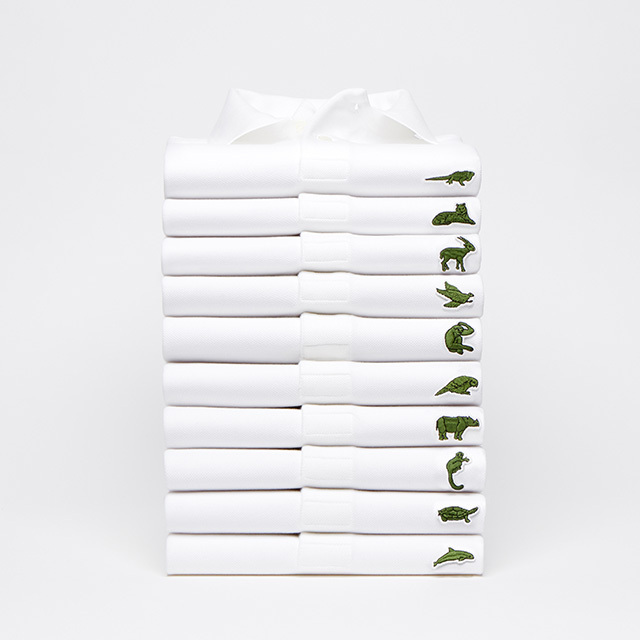 The popular crocodile logo embroidered on the Lacoste polo shirt has become an icon for 85 years. This year, however, the brand leaves behind the reptile for 10 other endangered animals. For its limited edition Lacoste x Save Our Species collection, Lacoste collaborated with International Union for Conservation of Nature (IUCN) to protect 10 highly threatened species, which includes the Vaquita or Gulf of California porpoise, the Anegada ground iguana, the Burmese Roofed turtle, the Northern Sportive lemur, the Java rhino, the Cao-vit gibbon, the Kakapo, the Californian condor, the Saola, and the Sumatran tiger. What makes this collection an even more effective campaign is that only 1,775 shirts have been produced, which equates with the sum of each species in the wild—from the 450 Anegada ground iguanas and 350 Sumatran tigers down to the 40 Burmese roofed turtle and the 30 remaining Vaquitas. Aside from the limited-edition shirts, Lacoste also unveiled its Fall 2018 collection at Paris Fashion Week. Designer Felipe Oliveira Baptista culled inspiration from Lacoste creator and tennis player René Lacoste and wife Simone’s tree development project during World War II. The project, which resulted in the planting of 50,000 trees in Saint-Jean-de-Luz in France, was established to protect forestry workers from toiling in labor camps during the period. The shirt is already available with all proceeds set to fund IUCN’s projects for wildlife conservation worldwide. “This is our way of planting trees in 2018,” Baptista wrote in a note.